An average family of 4 can save big money if they use coupons. Most coupons are worth $.75, and most families buy on average 80 items a week. It's important for shoppers to try to get a coupon for most of the items in their grocery cart. 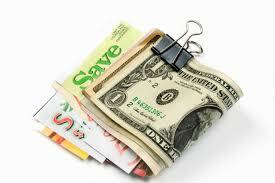 Here are some tips on how to maximize savings by getting and strategically using more coupons. 1. Make a plan! You will need a plan to really stack up your savings. Look at last week's receipt. Are there items on there you plan to buy again this week? Are there brands you can swap that have a coupon? How about generics? Use the weekly ad to look and see if any particular brand is on sale. Does that brand issue coupons, and if so where are they? Use coupon databases like Hot Coupon World to see if there is a coupon for that brand that is valid for today's date, and where it's issued. Is it a digital coupon, newspaper, or in store type? 2. Know all the savings tools you can use in your area. Digital coupons are available from County Market. You can also get Sunday newspaper inserts delivered from your local paper. There are online printable coupons from regular sources and brands. Search for favorite items, then contact the manufacturer to find out all the sources where they offer coupons. 3. Build your coupon stash. A coupon stash is an assortment of coupons you gather that you can use at any point in time. These should always include the free Penny Pincher coupons issued by County Market. Your newspaper coupons, free coupons from neighbors and friends, workplace newspaper coupons, and coupons you pick up in restaurants. Double up on coupons you really like. Don't buy one newspaper insert with your favorite brand, but go ahead and pick up two or three. 4. Make a coupon match. It's the rule of couponing! When you see a sale price, and a store offers a discount, match that sale price up with a manufacturer's discount via a coupon. This gives you savings from two different places. These savings area "Matched" weekly. This is how families can really save big money on groceries. 5. Get to know the coupon policy. It's written so that both the user and the store know and understand how the discounts work. There is no limit on the number of coupons you can use at County Market. The computers can scan up to 999 in one transaction, and so far no one has come close to that many coupons in one check out. If County Market allows that type of deep and unlimited savings, familiarize yourself with the policy and start saving big money!